If you use iDVD much, you’re probably familiar with the Apple logo watermark that (optionally) appears on your DVD’s menu screens. (You can enable and disable the watermark in the Menus section of the General tab of iDVD’s Preferences.) While the Apple logo is nice and tastefully done, you can actually use that space for a watermark of your own—which may prove to be more useful than just stamping Apple’s logo on your latest project. To replace the watermark, you’ll need to have Apple’s Xcode development tools installed—I described how to do just that a few years back. The specifics may have changed a bit in the interim, but the basics are the same. Register for a free developer account on Apple’s developer site, download Xcode (it’s a big download), and install it. This week’s hint uses Quartz Composer, a utility installed when you install Xcode. You’ll also need a graphics program that can create images with transparency. I’ll use Adobe’s Photoshop CS3, but other programs should work just fine. Once you have the prerequisites out of the way, the process of replacing the watermark is surprisingly easy. First, make sure iDVD is not running, then Control-click on iDVD in the Applications folder. Select Show Package Contents from the pop-up menu, and in the new window that opens, navigate into Contents -> Resources. There are a lot of files in this folder; scroll down near the end of the list and you’ll see a file named Watermark.qtz. Hold down the Option key, and drag this file to your Desktop (or other such location). This will create a copy, which will serve as our backup in case anything goes wrong with this process. Leave the Resources folder open when done; you’ll use it again later. Next, you’ll need to have an image. 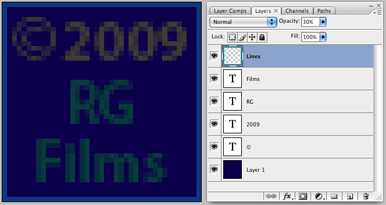 The watermark in iDVD is a 41x41 pixel TIFF with translucency. Create a new 41x41 pixel image in your favorite editing program. To make the editing easier, I use a multi-layer image, deleting the background first, then making the lowest layer some solid, dark color (which makes it much easier to see what you’re doing). I then add additional layers as necessary, setting the opacity of each layer to 35 percent—you can experiment with different opacity values to find one you like. On the additional layers, use white for a grayscale image, or feel free to experiment with colors—but because of the opacity settings, remember that your colors will be dulled in the iDVD project. A sample Photoshop image is shown at right, showing the layers and the final image (zoomed in). When you’ve got the image set up as you like it, save it, then disable (turn off) the dark color layer. This is a critical step, otherwise your final image will have a solid background. To make the image usable in iDVD, save it as a TIFF with transparency. (Other image formats that support transparency will probably work fine, but I haven’t tested them.) To keep the file size smaller, disable layers when saving as a TIFF. Once you have your TIFF image, return to the Resources folder (you left it open earlier, right?) and double-click on Watermark.qtz, after insuring you have indeed created a backup copy of it. The Watermark.qtz file is what iDVD actually displays onscreen, so you need to import your new image into this file to make it active. When you double-click Watermark.qtz, Quartz Composer will open, and you should see at least two windows—an Editor window and a Viewer window. If you’re missing one or the other, just use the Window menu to make them visible. In the Editor window, click once on the green-titled Watermark block on the left side of the window. 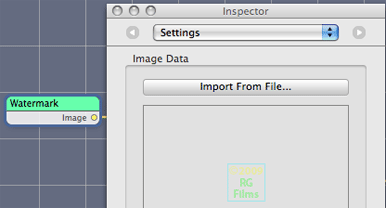 Next, click the Patch Inspector button in the toolbar. When the inspector panel opens, click the drop-down menu at the top and select Settings. In the Image Data section of the panel, click Import from File, then navigate to your newly-created graphic and click Open. Now just save the file, and you’re done—the image is actually imported into Quartz Composer, so you don’t need to worry about saving that image somewhere where iDVD can find it. If you happen to be a Quartz Composer wizard, you’ve probably figured out that since the watermark is a Quartz Composer file, you can actually create an animated watermark. I’ll leave that as an exercise for the Quartz Composer pros, however, as it’s beyond my experience.